It is an efficient solution to export exchange Mailbox to EML file format along with attachments. 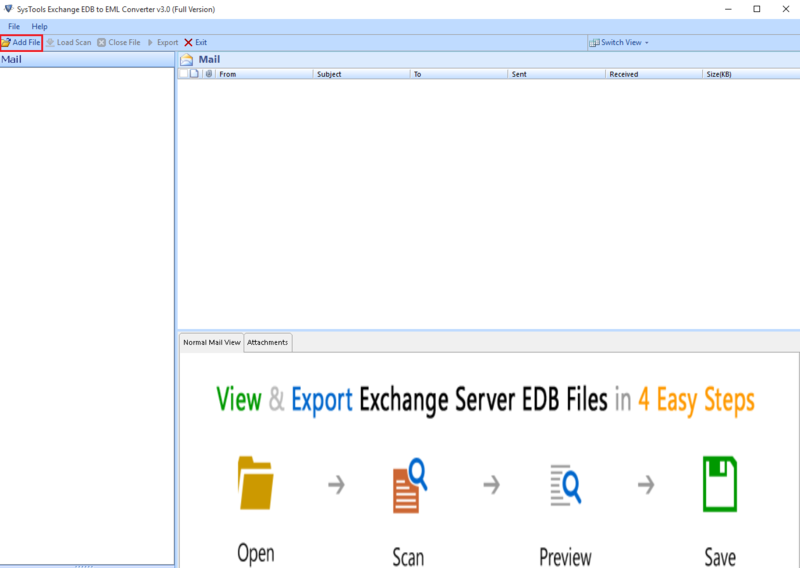 Moreover, the conversion is possible for both Priv.edb and Pub.edb files of Exchange database. Also, this utility to export EDB to EML file does not require Exchange server environment for the migration. The Exchange EDB to EML Converter tool does not require MS Exchange Server account to be installed on the user system. 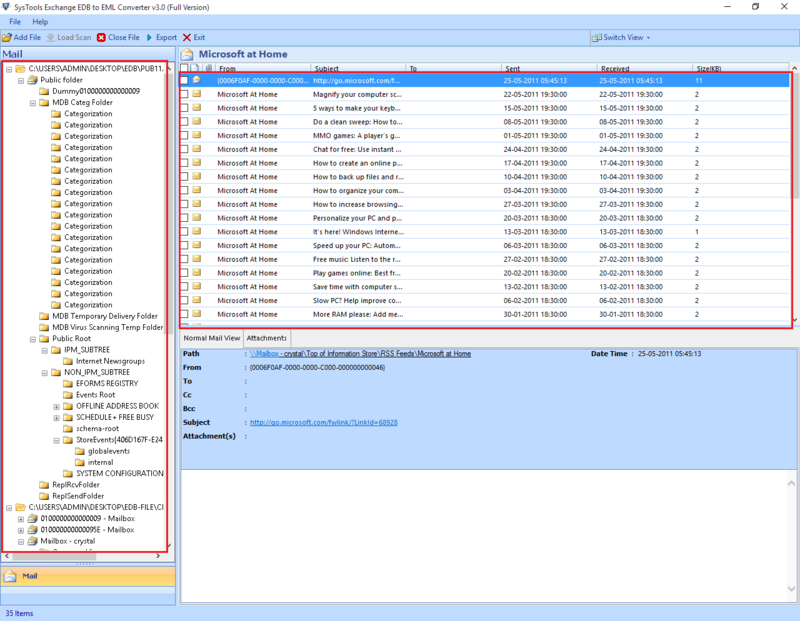 The utility can support EDB files from Exchange Server 2000, 2003, 2007, 2010, 2013, 2016 etc. to export EDB files to EML format. The software to convert Exchange database EDB files to .eml format can work on all versions of Microsoft Windows like Windows 10, 8.1, 8, 7, Vista, XP and all other below editions. EDB to EML converter tool allows the user to convert multiple emails from Exchange mailboxes to EML format at once. It also maintains the meta properties of all emails during or after the migration process. 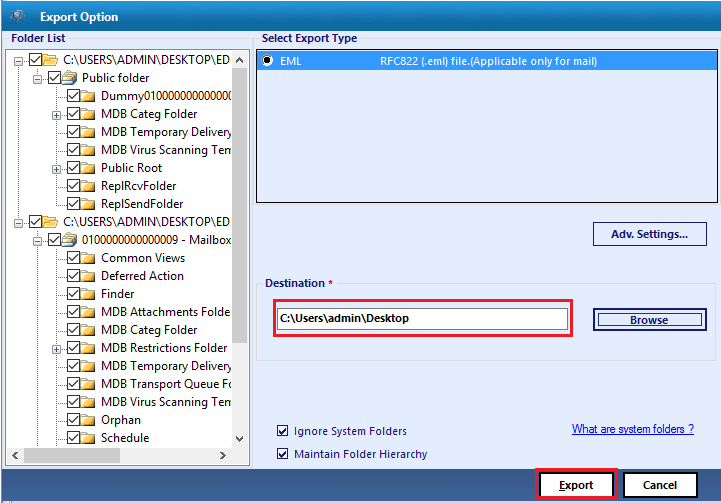 It can export mailbox from EDB file with attachments to EML file type without any inconvenience. 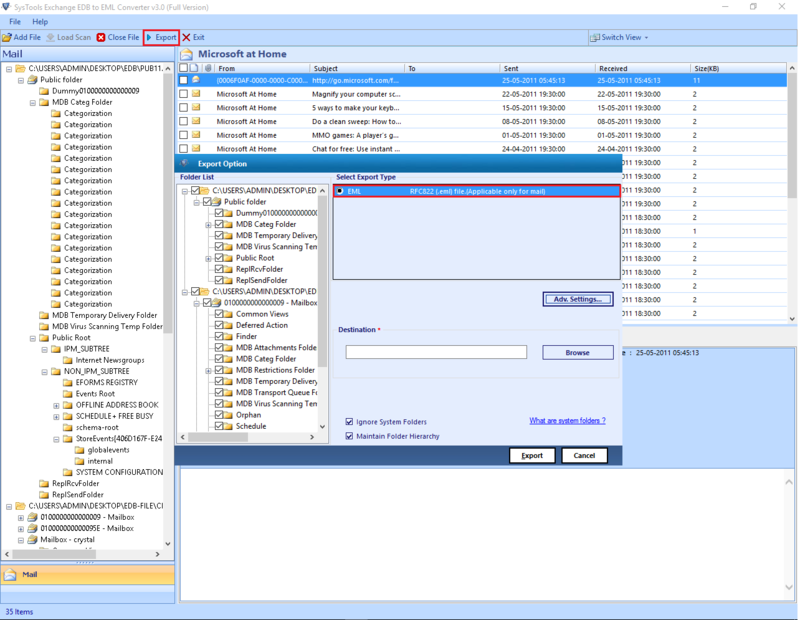 This utility offers two file scanning modes i.e., Quick and Advance scan in order to extract data from the database file. In case, if the files are healthy then, the software will perform the quick mode but if users have highly or damaged files then, choose the advance scan option to resolve the issue from the data file. Once the scanning and loading have been done then, EDB to EML converter software also scans and loads the complete EDB database. After loading of EDB file, the software can see all data in each mailbox like emails, contacts, etc. Also, the Exchange to eml converter will display complete attributes of each data item containing to, from, sent date, cc, bcc and more. This application permits the user to export selective items from Exchange mailboxes to EML instead of migrating all EDB files to EML. Even a user can check or uncheck the desirable items that they want or do not want to convert into .eml type. This tool also creates a separate folder for each EDB mailbox to save all emails into EML format. When the conversion of EDB file begins, this tool to export Exchange email to EML creates the complete export progress report. The user can easily view the progress through three tabs i.e. Pending, In Progress and Completed. This report will display the name of mailboxes, the completion status of mailbox conversion and a total number of transferred emails. How to Convert Exchange Emails to EML Files? Step 1 : Launch EDB to EML Converter software and hit on Add file to add the EDB file. 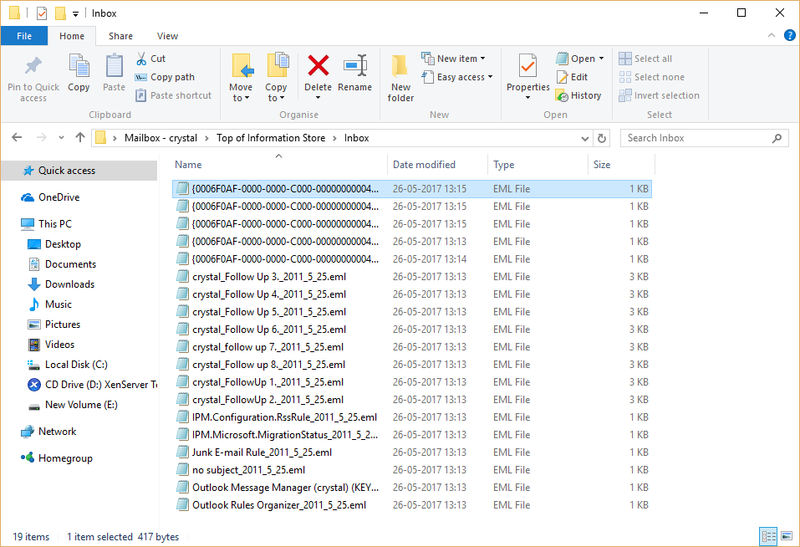 Step 2 : Preview all files and folders in the .edb format in the mailbox of Exchange Server account. 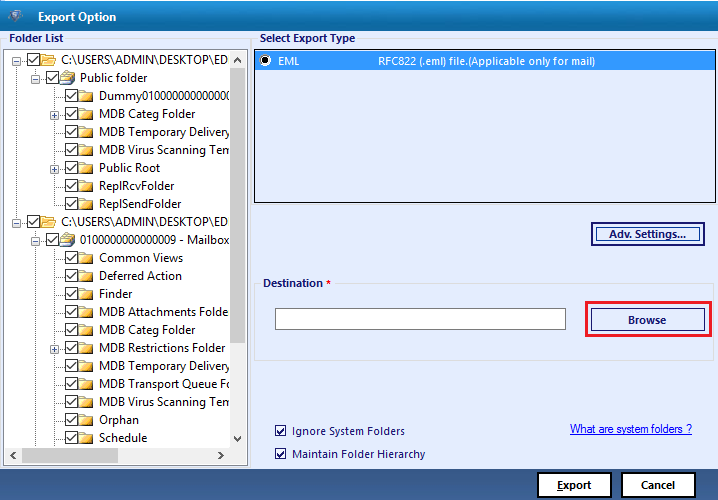 Step 3 : Now press on Export button to migrate Exchange database EDB files into EML format. Select EML radio button and then apply the settings to convert Exchange files to EML format. Click Export button. Step 4 : Now chose Advanced Settings option. Step 5 : Configure the required EML Settings like Naming Convention, and Date & Time Filter options. Then hit Save button to save your settings. 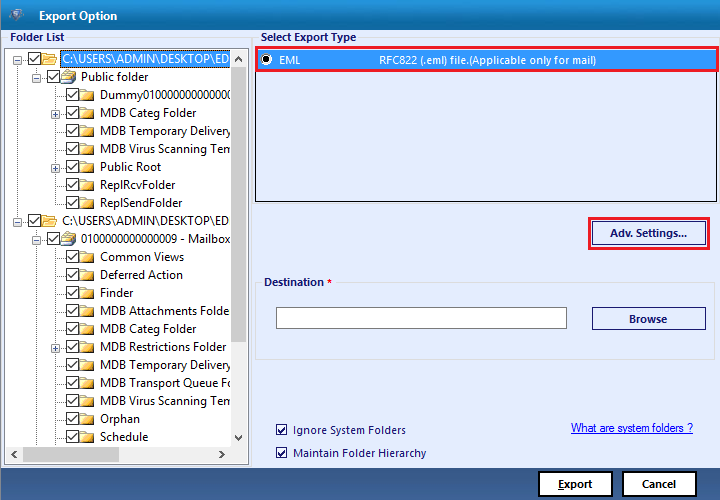 Step 6 : Now browse the location to save the exported Exchange email to EML format. Step 7 : See the path of the destination location. Now click on Export button. Step 8 : After converting, EDB to EML Converter tool will display a success status. Press OK. 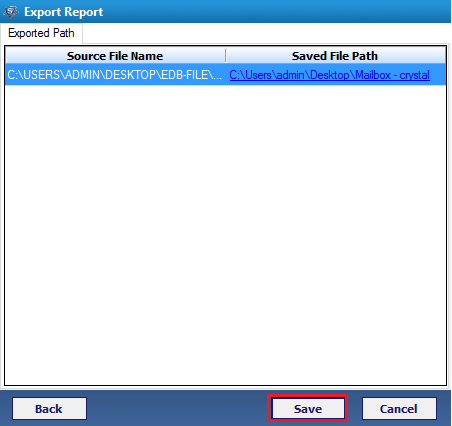 Step 9 : Now press Save button to store the Export report as CSV format. 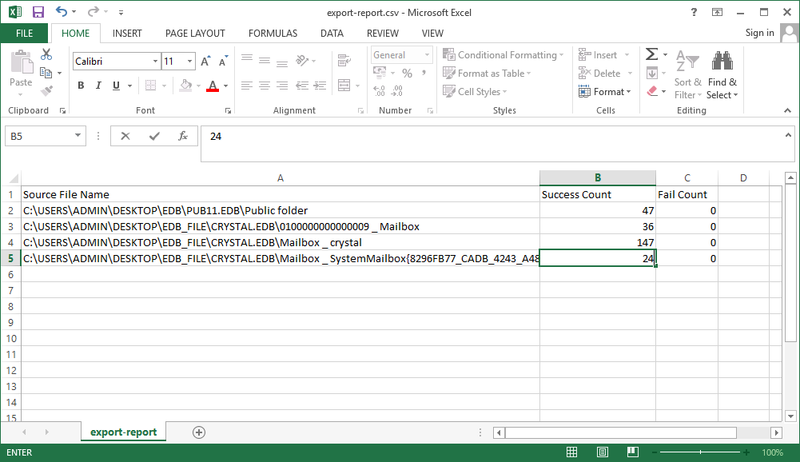 Step 10 : View the Export Report in the saved location and access the file in MS Excel. Step 11 : Go to destination file location. View all the files converted to .eml format. Watch!! How to Export Exchange Emails to EML? Q. Does this software export mailbox from .edb Exchange along with attachments to EML? Ans: Yes, this application easily converts Exchange EDB file to EML format along with attachments without losing any bit of data. Q. What is the maximum size of Exchange EDB files supported by this tool? Ans: There is no limitation on Exchange EDB file size. 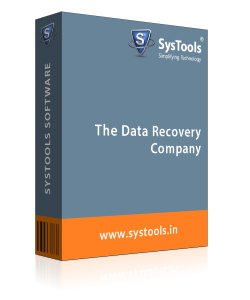 This product allows migrating any size of Exchange emails to EML format without any hassle. Q. Is it possible to export all emails from Deleted Items Folder? 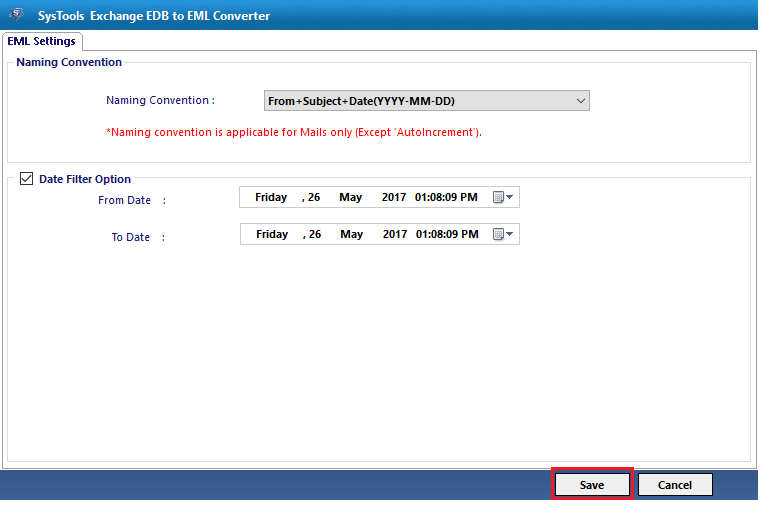 Ans: Yes, with the Exchange EDB to EML Converter software users can import emails from Deleted Items folder. This application easily converts all data of EDB file into EML format.e. Note: EDB to EML Converter Software will get delivered on your registered email id, within few minutes after placing the order. Exchange EDB to EML converter is an outstanding tool and it has various functions. Moreover, the applications have its algorithm in such a way that it exports all Exchange mailbox items into EML file format separately. No need to search for other application for separate tasks, as this software handles everything on its own. Thanks for developing such a wonderful product. I had lots of opportunities lined up in front of me to get all my Exchange mailbox into EML file type. However, I was searching for the best utility that I can trust. Then, I found this software to export Exchange email to EML format. I must say, this utility is very user-friendly, efficient and reliable for the conversion. Thanks a lot!